In 2017, Khan’s Tutorial helped 720 students score perfect 4/4s on their Common Core exams. 298 students scored a single 4/4 while 423 students scored two or more 4/4s. A score of 4/4 means that these students met and excelled beyond the standards set for elementary and junior high school students. This places KT students amongst the top 19.25% of students who scored a 4 on their 2017 Math exam and the top 13% of all NYS students who scored a 4 on their 2017 ELA exam. In terms of students in KT’s High School Achievement Program, over the past year 253 students scored a 90 or above on their Regents Exams and 120+ students received a 1300 or above on their SAT exams. KT student Sharah Nabi was recognized for her near perfect score of 1580 on her SAT exam. “This is the fourth annual KT Achievement Awards Ceremony and I am thrilled to see the number of students celebrating with us grow each year. We are not only celebrating our students perfect scores this year but also the countless days each week that families dedicate to their child’s education. Finally, I’d like to thank the Quality Managers who contribute their weekends to Khan’s mission to improve student test scores and educate for life,” said Director of Common Core, Nadia Hossain. While Khan’s honored these elected officials and community leaders, Khan’s also recognized several Quality Managers for their outstanding work in education. "Bangladeshi and South Asian New Yorkers are one of the fastest growing immigrant groups in all of New York City. 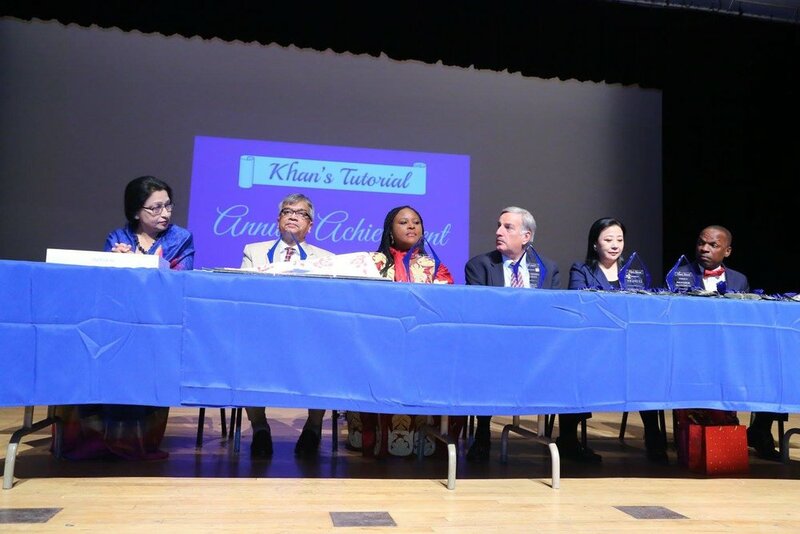 In order to properly educate our community, Khan’s Tutorial vows to build on our work with a continued focus on quality, sincerity and mentorship. We thank our friends and community leaders attending from the press tonight. We thank our esteemed honored guests. We thank our Uncles, Aunties, brothers and sisters. Most importantly, we thank the students whose hard work brought us here in the first place!” said KT CEO & President Dr. Ivan Khan in his remarks.